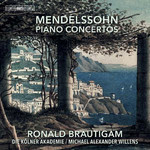 Ronald Brautigam has recorded more than 60 discs for BIS, including the complete solo keyboard music by Haydn, Mozart and Beethoven on the fortepiano. But his first releases on the label, in the mid-1990s, were Felix Mendelssohn's concertante works for piano and orchestra on modern piano. When he now returns to these scores, it is on a copy of a Pleyel grand piano from 1830 -the year before Mendelssohn composed his Piano Concerto No. 1 in G minor. And the orchestra supporting him is the period band Die Kölner Akademie under Michael Alexander Willens, the same team that he has already collaborated with for an acclaimed 11-disc survey of Mozart's keyboard concertos. The historically informed accompaniments and the clarity of the solo instrument contribute to performances of a great charm and freshness, shedding a new light on these works. Composed between 1831 and 1838, they were all written primarily for Mendelssohn's own use as a touring concert pianist, but soon entered the repertoire of many other pianists -especially the G minor concerto, which was extremely popular in the composer's own time.